Satellites are keeping tabs on the state of Arctic and Antarctic sea ice, and have observed considerable declines in ice extent in many areas since records began, but what do we know of past sea ice extent? Ice cores keep an excellent record of climate change, but until recently, ice cores have not been used to quantify patterns in past sea ice extent because few reliable compounds are preserved in the ice. While methanesulphonic acid (MSA) has been used in the past, it is an unstable compound and is easily remobilised after it has been deposited. The amount of sea-salt sodium deposited in brine pools or as high salinity crystals known as ‘frost flowers’ that form on the ice surface can also be used to identify changes in sea ice extent. These deposits are difficult to distinguish from larger sources of sea-salt sodium (aerosols and sea spray) though, making it a poor proxy. Recent research published in Atmospheric Chemistry and Physics may provide an answer. An international team of geochemists have identified two stable indicators of sea ice extent in ice cores: the halogens bromine and iodine. The oceans are considered to the be the main reservoir of bromine and iodine, but satellite data show these halogens also have a strong link with sea ice at the poles. 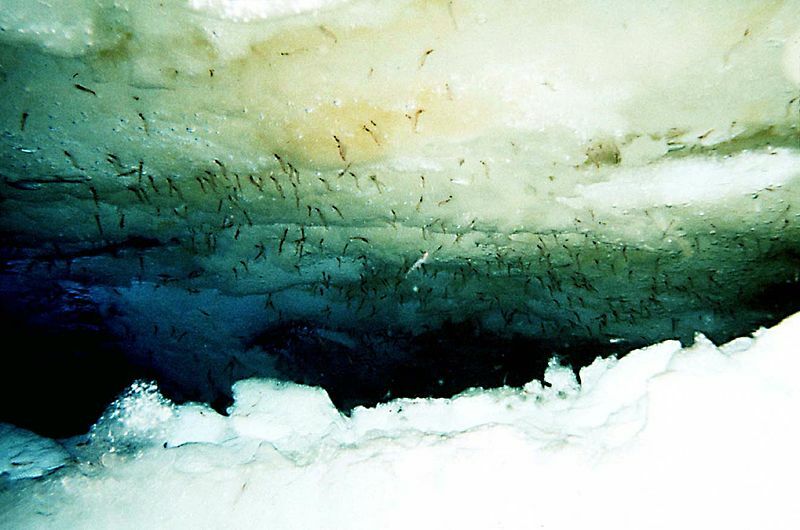 Furthermore, recent research suggests that algae that grow under sea ice are big contributors to atmospheric iodine. Sea ice provides a substrate for algae to grow on during the spring. It is thin enough for light to penetrate, allowing the algae to photosynthesise, and also allows compounds produced by the algae to reach the atmosphere, including iodine and iodine oxide. These peaks in iodine oxide production are spotted by satellites during the spring. During interglacials, the extent of sea ice is much smaller than during a glacial period. This means that the thin sea ice (where iodine is released into the atmosphere) is much closer to the coast. Air bubbles trapped in compacting continental snow preserve these atmospheric gases, which can be sampled in an ice core at a much much later date. Thus, when there is more iodine in the ice core, the extent of sea ice is small; when there is less, the thin edge of the ice sheet was much further from the coast. Satellite measurements also show the amount of bromine oxide in the atmosphere peaks during the polar spring. This is because the increase in light level stimulates a series of photochemical reactions that convert bromine salts into bromine and bromine oxide, releasing it into the atmosphere. These events are known as bromine explosions and result in an increase in atmospheric bromine. Because the extent of sea ice is reduced during interglacials, bromine explosions must occur closer to the Antarctic coast, meaning more bromine will be trapped in the ice sheet during an interglacial period. Using sodium as a proxy for the amount of sea salt in the ice core, Andrea Spolaor and her team were able to work out how much of the bromine was in the atmosphere at the time. Since bromine explosions result in an an increase in atmospheric bromine, but have no effect on sodium, these events can be identified when the ratio of bromine to sodium in the ice core is high. Now we can work out the extent of past sea ice, what lies ahead? The first part of the IPCC 5th Assessment Report released earlier today concerns the physical changes in the Earth’s climate and what we can expect in the future; the future of our changing planet will be discussed at this year’s Geosciences Information For Teachers workshop at EGU 2014, and you will be able to find a great discussion of climate change, its history and its impacts in the next issue of GeoQ – stay tuned! Spolaor, A., Vallelonga, P., Plane, J. M. C., Kehrwald, N., Gabrieli, J., Varin, C., Turetta, C., Cozzi, G., Kumar, R., Boutron, C., and Barbante, C.: Halogen species record Antarctic sea ice extent over glacial–interglacial periods, Atmos. Chem. Phys., 13, 6623-6635, 2013.